In his Presidential address at the Annual General Meeting in December 1926 Percy Williamson stressed the fact that the past year, albeit a very successful one, had formed but a phase in the Club’s history. It was part of a gradual building-up of a tradition which would, in the years to come, bring added glory to the name of the Cheshire Roads Club. The Club was then thirteen years old, and as the fiftieth anniversary approaches the accuracy of Percy’s forecast is clearly proved. But the game of cycling in general was to develop rapidly, too, and perhaps even Percy did not envisage the rapid growth in the number of racing clubs, and the tremendous increase in the number of open events. To those of us who were young, steeped in the writings of middle-aged and aged cycling journalists such as Bidlake, Stancer, ‘Wayfarer’, and ‘Kuklos’, the best days of cycling sport seemed to lie in the past, wrapped up in the wonderful performances of G. P. Mills, F. T. Bidlake himself, F. W. Shorland, A. A. Chase, Harry Green, F. H. Grubb and Leon Meredith. But, although we did not know it, really great days lay ahead! Perspectively here are some of the best rides done in 1926. F. W. Southall, the famous Norwood Paragon member, did 2-8-28 in the Etna ’50’ (the Easter Monday fixture which the Charlotteville C.C. took over in 1929 on the demise of the Etna C.C. ), and 1-1-57 in the West London C.A. ’25’, each being competition record at the time. Southall won the Anfield ‘100’ in 4-55-10, and on the same Whit Monday W.B. Temme (Glendene) was fastest in the University ‘100’ with 4-44-48 – not a bad comparison between northern and southern courses. J. W. Rossiter (Century) won both the big 24-hour events held in the south, the Catford with 405 1/2 miles and the North Road with 407 1/2, the latter being competition record. Southall won the Bath Road ‘100’ in 4-45-58 and Jack Lauterwasser (Finsbury Park) covered 222 3/4 miles to win the Polytechnic Gaylor 12-hour event. The most resounding performance of the year, however, came at the end of the season. Jack Rossiter went for the R.R.A. London – York record and set up new figures of 9-40-0. Continuing for the R.R.A. 12-hours, he finished with 242 1/2 miles, the first time an unpaced ’12’ had been done at ‘evens’. Straightaway, of course, but what a sensation it created at the time! Comparable performances in Cheshire during 1926 can be referred to in the previous chapter. The only ’24’ outside the London area in 1926 was the Anfield event, won by Ed Sutton of the Manchester Grosvenor Wheelers with 388 3/4 miles, a remarkable ride for northern roads by a member of a remarkable family. Ed Sutton was one of the well-known Sutton brothers who were a by-word in Cheshire cycling circles at the time. Not for all the tea in China would I mention any of their famous exploits. They were all big men and great riders. After finishing in the Anfield ’24’ on the Saturday evening (after a Friday evening start) Ed retired to well-earned repose only to be wakened in the small hours of Sunday morning by stones thrown on to his bedroom window by brother Wilf. Wilf was riding in the Manchester Unity (the Suttons’ own private club) ’25’ that morning and wanted to borrow Ed’s tights! Now these tights had taken a bashing in the ’24’ but Ed threw them through the window, and Wilf, wearing a nether garment practically without bottom and almost indecent, went on to win the ’25’ in 1-7-0 to record a double victory for the Sutton family. In came 1927. The Annual Dinner was held once more at the Exchange Hotel. The attendance was disappointing, only 44 members and friends attending, but the usual good time was had by all.. Tickets for Dinner cost 6/0d. Here are a few more current costs – a four-page issue of the ‘News’, 27/6d; 80 Club handbooks, 40/0d. ; prizes in club events – £2 for fastest and for 1st handicap, 30/0d second handicap, and 20/0d. third handicap. The Easter Tour was a great success. A quotation. of 7/0d for hot supper, bed and breakfast from Far End Farm, Coniston was accepted. Those taking part were “Molly” (Albert) Morgan, Frank North, Steve Blount, Arthur Wood, ‘Andy’ (Harold) Wilson, George Mundell, Jimmy Atherton, Bert Bracewell, and his friend George. Feeding at the farm was on a gargantuan scale and the weather, for this wet year, quite good. Easter Saturday saw the party scaling Stock Ghyll to Kirkstone summit with lunch at Patterdale. Afternoon tea at the Horse and Farrier at Threlkeld was followed by a strenuous ride over Dunmail Raise in order to get to Coniston in good time for the evening meal. Sunday was spent walking over the hills to the picturesque village of Hawkshead. Arthur Wood achieved fame (or notoriety) by his celebrated rendering of ‘Bye Bye Blackbird’ whilst tickling the ivories on every possible occasion during the week-end. Smith Parker was in sparkling form this Spring and everybody expected great things from him after his wonderful rides in Club events during 1926. By the way, Parker’s only Christian name is Smith but he was (and still is) invariably known as ‘Syd’ and will be thus referred to hereafter in this narrative. To see Parker arrive at Cheadle Green on a Sunday evening in the van of a club scrap was a sight indeed. Immaculately attired in ‘posh’ plus-four suit he would idly wipe his brow and appear as fresh as a daisy whilst those he had dropped came labouring in afterwards. Of course, Cheadle Green was the cyclists’ Mecca in those days. Most clubs started and finished their runs there and the number of ‘blinds’ through the narrow High Street was legion. Motor traffic was pretty light on winter evenings and although we thought it heavy in Summer it was negligible compared with modern conditions. Thus, on a Sabbath evening the ‘Green’ was a mass of racing bicycles leaning against the dilapidated wooden stumps which ringed a patch of faded grass. Add to them the owners of the machines and a religious body trying to carry out an open-air meeting. Trouble was bound to come. The police and the local council stepped in, the ‘Green’ was re-turfed, concrete posts with encircling chains erected and cyclists en masse barred for ever. Whilst it lasted Cheadle Green was an institution. Most clubmen felt a run was incomplete without stopping at the ‘Green’, if one desired to see a kindred spirit he was always to be found there. The first event of the season was a Club ’50’, held on May 22nd. There is no record of any member having raced before this date in this particular year, so it was a ‘pipe-opener’ for everybody. The course started near Cranage, went north through Knutsford, Mere Corner, and High Legh to the Dog and Dart at Grappenhall. Here, at 15 miles, was a turn in the road and the course retraced to the start, on south-wards through Holmes Chapel where at 40 miles the last turn was made in front of the Lawton Arms at Church Lawton, and the finish was very close to the start. Parker continued where he had left off in 1926. He returned fastest time of 2-19-48 and from scratch was first in the handicap. Len Johnson was second fastest in 2-32-50 so the exceptional merit of the winner’s ride is clearly seen; Bert Bracewell was third fastest in 2-39-37. Jimmy Atherton and Jimmy Royle were second and third respectively in the handicap. Fred Turner, of whom much will be heard later, returned a most disappointing 2-43-9, but whilst being rubbed down by Bert Bracewell after the race was heard to say that he would not be satisfied until he had beaten 2-10! We all learned later that he meant what he said! Sixteen men were on the card. Whit Monday found Parker our only representative in the Anfield ‘100’. He was riding a tricycle and on a wet and windy day he retired at 55 miles. Frank Southall was fastest in 4-47-21, a terrific ride on a hard day on northern roads. Charlie Marshall, the famous Vegetarian C.C. member, had finished earlier with a possible winning time of 4-56-18 (indeed it was second fastest) and on Southall coming in to annihilate his time Charlie offered his good wishes to which Frank replied, “How did you like your beans today, Charlie?”. I did not get this at the time, but of course, Southall liked his roast beef and ham and eggs, and was possibly rubbing it in. The Manchester Wheelers’ ’50’ was held in June on a Saturday afternoon (start 4-01 p.m.) on the Shawbury triangle. Most riders worked on Saturday morning, and needed train assistance to get to the race. Afterwards, however, was the occasion of a grand get together in the Elephant and Castle or at Shawbury Post Office, both popular places with club cyclists. Parker was not at his best in returning 2-28-49; Frank North did 2-33-45 and Bert Bracewell 2-38-49. Steve Blount retired. J. K. Middleton returned fastest time, 2-15-10. The Manchester Grosvenor Wheelers’ ‘100’ was held on a Saturday afternoon in July with a 4-0 start. This meant that slow, late starters (despite the field not being very big) needed lamps to finish! Not a few riders finished outside six hours! Most competitors stayed out after the event but the impecunious ones rode home and it was no unusual sight to see racing men walking up the slight inclines of the railway bridges on Kingsway in the small hours of the Sabbath. Of our eight riders Parker (although not supposed to be a stayer) made a new club record with 5-17-5; Fred Turner’s fine first hundred ride of 5-28-12 won him the third handicap prize; other times were H. Bracewell 5-31-47; A. C. Wood 5-32-58; J. B. Atherton 5-37-55; and Steve Blount 5-42-0. Frank North and Charlie Danby retired. Anfielder, Bren Orrell won the event in 5-11-0. The second Club ’50’ was held on the following week and again Parker returned fastest time – 2-19-8. Len Johnson was second fastest in 2-22-27 (third in handicap) and Fred Turner third fastest with 2-24-54 (second in handicap). Ike Astles, a veteran of over 50 years of age took first handicap prize with an actual time of 2-48-37, less 37 minutes. With his winning ride Parker set up a new Club record. A week later came the Sharrow ’50’ in which we were represented by Parker and Andy Wilson. Syd with a fine ride of 2-18-6 (a further improvement of Club record) was second to J. B. Salt’s (Clowne Wheelers) 2-13-31. Andy did 2-45-17. Frank North covered 201 miles and Ron MacQueen 184 miles in the Lancashire Road Club ’12’. The East Liverpool Wheelers’ ’50’ was held August Bank Holiday on the Shawbury triangle. Parker had entered for the event and during the week before the race had been touring in Devon with Jimmy Webster. Making their way back north by leisurely stages Syd’s front forks collapsed in the vicinity of Swansea. After much delay he got them patched up and by hard riding reached Shawbury just in time for the race. Under the circumstances Syd’s time of 2-21-8 for second fastest to Bren Orrell’s 2-19-42 was a very good ride. Poor old Jimmy also rode and returned 2-39-57; L. Johnson, H. Bracewell and F. W. North had respective times of 2-26-6; 2-32-58; and 2-34-25. It was obvious that Parker had the N.R.R.A. ’50’ bicycle record in his grasp. This stood to the credit of J. W. Brooke (Gomersal) with the figures of 2-17-15. On August 14th came the great day. Starting at 5-30 a.m. on the Broken Cross course, Syd found conditions almost ideal being calm and warm. Keeping inside a hot schedule at all points our man reached the foot of Agden. Brow in the great time of 2-12-57, beating record by 4 mins. 18 secs. For a course which was not straightway, although it had advantages over the normal Cheshire courses used in competition, it was a magnificent performance, fully in keeping with the great standards set up by Horace Pryor. The 12-hours Standard Medal Ride on August 20th (a Saturday) proved to be an exciting event. The Gold Standard stood at 190 miles and Len Johnson stated publicly that it was ridiculously low and should stand at 200 miles at least. Nobody agreed with him and he was told to prove his contention in the Club ’12” or eat his words. Len said he would – and he did! But he had to do it on the worst day on record. It was a cold day for August with a nasty wind but at 6 a.m. it was dry at the start and everybody got away happily. Then rain commenced and poured in torrents all day until the last hour or so. When it ceased the riders’ tights and alpacas dried on them and, in the intense cold, they rode the finishing miles with stiff joints and starved to the marrow. Arthur Wood packed in before 40 miles. He wasn’t tired, he really didn’t mind the rain (at least so far) but his bicycle was getting dirty! Anybody who has seen Arthur clean his bicycle on tour knows this story to be perfectly true! Anyway, Johnson proved his point with a really great ride of 201 1/2 miles, very hardly won, and he qualified for a Gold Standard! Jimmy Webster finished with 193 miles, also winning a Gold Standard. Other finishers were J. B. Atherton 189 1/2 miles, Harold (Andy) Wilson 186 miles, George Mundell 182 miles and our veteran Ike Astles 173 1/4 miles – heroes all! This event certainly goes down to posterity as Johnson’s ’12’. On September 4th Sparker returned second fastest time in the Palatine ’50’ with 2-19-51. Len Johnson did 2-20-46 and was disqualified for not having a bell. Len lost some time at the start and had he started to time and to rule would have won the event! F .W. North did 2-29-5; R. MacQueen 2-40-12 and F. Turner (riding for the Manchester Wednesday) 2-29-7. The last event of the season was a Club ’25’ on September 11th. Syd Parker returned fastest time in 1-6-40; Len Johnson was second fastest and first in the handicap with 1-8-21; and Fred Turner third fastest and second in the handicap with 1-9-0; Jimmy Atherton was third in the handicap with 1-12-2. Another club record for Parker. The season’s racing activities came to a close with an unsuccessful attempt by ‘Sparker’ on the N.R.R.A. 50 miles tricycle record. A subsequent attack on the same record was to succeed – that will come later. Syd had ridden throughout the season with a panache that was a joy to behold. A natural humorist and a born ‘Card’ wherever he went fun was fast and furious. A club run with Parker was one long laugh, and although he took his racing more seriously than perhaps he outwardly showed, he was the classic example of the now long extinct racing man who raced for fun. How he ever achieved some of his fast rides made one marvel. At that time Parker’s Mother kept a ‘pub’ in Salford and on the occasion of a club race he often left home at closing time to reach his racing quarters at Cranage close on midnight. He then proceeded to play the piano well into the small hours. First man off 5-31 a.m. and he would record a time for 50 miles in the region of 2-19. Great fun and great days! Late in October news came along the ‘grape-vine’ that Joe Brooke intended to attack Parker’s Northern ’50’ record, using a straightaway course along the Great North Road from Scotch Corner to Boroughbridge, and then veering south-east to York and the finishing point near Market Weighton. Bert Bracewell and Ron MacQueen decided on an all-nighter in order to be present at the finish and observe the usual courtesies on behalf of the Club if Brooke were successful. They left Manchester on a dark Saturday night at 7 p.m., crashed over the setts to Ashton and Greenfield, and slogged up Standedge to the Floating Light on the roof of the Pennines in time to replenish the moisture lost during the climb. Then down with a rush to Slaithwaite for a ‘buckshee’ supper with friends. Resuming at 1 a.m. they passed through Huddersfield and Leeds and were particularly mortified to note the many breweries in Tadcaster all silent and still – Bert and Mac were so thirsty! York came at dawn and under the watchful eye of a policeman they surveyed the Minster and the Walls before adjourning to the railway station for a sandwich meal. Nineteen miles to Market Weighton but in spite of the level roads a nasty cross-wind made the going so tough that 2 1/2 hours elapsed before they reached telegraph pole No. 428. No signs of checkers, timekeeper, or would-be record breaker, but just as they were about to leave two strangelooking objects appeared on the skyline – heathen Yorkshiremen they thought – but no! they turned out to be two more misguided ‘Rogues’. Syd Parker and Jimmy Webster! And they were on their hands and knees and in a far worse state than Bert and Mac! The wind was obviously wrong for the record attempt and Brooke hadn’t started! So late in the morning a move was made towards home. Goole was the first objective but Sparker knew of a ‘short cut’ and the party wandered around a labyrinth of rutty lanes before the road came to a dead end at a little-used ferry on the Humber. After many shouts and much waiting a small boat and a much smaller oarsman appeared. Four men and four bicycles needed more than one crossing, but a pleasant sail first up stream and then down stream was expensive (in those days) at sixpence per head. Dinner was taken in state at the ‘Bug’ Inn, somewhere they knew not where, but still in Yorkshire and some 85 miles from the Eternal City. The wind blew hard and the hills got harder. “I’m corpsed” said Syd at Doncaster. “I’m nearly dead” said Bert. Mac said even more than that. Of Jimmy there was no sign. Rotherham and the setts came, and Mac (who was reputed to travel with a Bradshaw in his saddle-bag announced that there was a train from Sheffield at 8 p.m. But in the dimly lit streets of the City of Steel the party became separated. Only Mac knew the way to the railway station. He caught the train by the skin of his teeth – Bert and Syd missed it by inches! And as Mac travelled homewards with his feet up (and no doubt chortling to himself) the other two suffered mightily as they wearily surmounted Mam Tor to reach home at 1 a.m. more dead than alive. As for Jimmy, he was so far behind and in such a dreadful state of ‘knock’ that he reached home just in time to go to work! And all to see a record attempt that never took place! A fetish of the `twenties was the fixed wheel. Every clubman rode ‘fixed’ and anybody who did not do so invited ridicule and derision. It was ideal for racing and for the superb control it gave the rider on club runs and in traffic, but for touring in hilly country it was really nonsensical. But off we would go into Wales and Yorkshire and the Lake District to suffer such discomfort as only fast twiddling of a 63-inch fixed gear for days on end could bring. There was, however, unexpected (and possibly unintended) relief from high places. Frank Southall won the Bath Road ‘100’ in the competition record time of 4-37-22 and he used a freewheel! It happened like this. After riding in the World’s Championships on the continent so equipped he returned with so little time before the Bath Road event that he did not bother to change his wheel round to fixed. So if Southall could do it, anybody could and so the softening up process started. The fixed wheel had too many excellent qualities for the clubman to give it up entirely, but it was nice to tour in comfort without loss of face. At this time derailleur and retro-direct gears were only known to English cyclists by reason of inspired articles in the C.T.C. Gazette by Vernon Blake and by ‘Kuklos’ in the Daily News – very soon the derailleur gear would make a terrific impact on every phase of cycling. 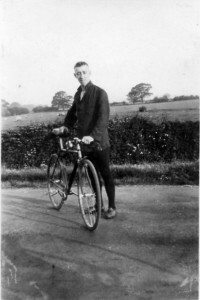 Although Harry Green had broken the End to End record in 1908 using a Sturmey-Archer hub gear, the friction of this gear was reckoned by clubmen to be too great a handicap for it to be used seriously. But, with the broadening outlook, this too was to come into its own for both speed-work and touring. Here are some of the prices we paid for Club medals and badges: one 9-carat gold medal and a silver medal cost £2-2-0d. and 7/6d., each, respectively. Twelve silver badges (genuine hall-marked) cost 3 /0d. each. Through the good offices of Reg. Danby (who was in the textile trade) the club obtained two dozen ties in Club colours for £2. Sold to members, they brought a profit of 10/0d. per dozen to Club funds. The Annual General Meeting in December 1927, was again held at the Swan (the Swan with Two Necks) at Bollington. Situated so close to Altrincham it was very handy for our older members to reach and, in the attendance of 34, there was a useful sprinkling of the elder brethren. Percy Williamson and Tommy Burnett were returned to the respective offices of President and Vice-President. Andy Wilson retained the Captaincy and, for the second year in succession, Bill Bailey took on the dual role of Hon. Secretary and Editor. Reg Danby continued as Racing Secretary. Altogether, he was to remain in office for seven years. During all that time (aided by his brother Charlie) every Club race was provided with a printed starting sheet, a distinction which very few clubs could boast. He proved to be one of the most efficient officials we have ever had. The big occasion of the meeting, however, was that on George Mundell retiring from the Treasurership he inveigled Arthur Wood into taking on the post. And some thirty odd years later Arthur is still our Treasurer a record of which he and we are very proud. Reverting to Johnson’s ’12’, the Gold standard was raised, but only to 195 miles and not to 200 as Len desired. Another case of labour in vain. George Mundell successfully moved a useful addition to Club rules, namely, that members or ex-members be eligible as candidates for honorary membership for services rendered to the Club.